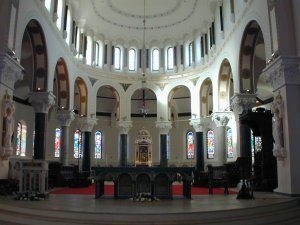 Properly the Metropolitan See of Munster, the Diocese of Cashel and the Diocese of Emly are commonly referred to as the Archdiocese of Cashel and Emly (more). Saint Ailbe is the Patron of the Archdiocese whose feastday is celebrated on 12 September. The following lists are of the parishes which comprised the Cashel and Diocese of Emly. Parliament ordered the union of Cashel and Emly in 1568, but Catholics did not recognise this. The union of the Cashel and the Diocese of Emly was formally effected in 1718, sixty-seven years after the last Bishop of Emly, Blessed Terence Albert O’Brien (1647-51), died for the faith on a Limerick scaffold when Cromwellian forces under Henry Ireton captured the city in late October 1651. Since that date, and, indeed, for long centuries before, both dioceses shared a similar historical experience. Canon Law has no such category as “Archdiocese”, but the name is popularly applied to wherever there is an Archbishop. An bishop appointed to an Ecclesiastical Province (such as Cashel) has the title of Archbishop and is responsible for fostering pastoral action and communication between bishops in the region. Such a bishop is a Metropolitan. Thus the bishop in Cashel and Emly diocese is Metropolitan Archbishop of the Ecclesiastical Province of Munster. A symbol of this appointment, the pallium, is given by the Pope to the office holder. The pallium is a type of wool stole and can be worn within the province. Cashel and Armagh are the original Irish Ecclesiastical Provinces, having first received pallia from Rome as a result of the request initiated by Saint Malachy to Pope Innocent II in 1139. Four povinces with thirty-eight dioceses in total were instituted in the 1152 Synod of Kells. As is the case with the Irish Saints of this time, little is known of Ailbe’s dates or life. It is believed that Saint Ailbe is one ofthe pre-Patrician saints though some annals note his death in 528. He was the child of a clandestine union. The father, fearing King Cronan, fled before the child was born. The King ordered that the baby be killed but his servants left him near a rock where, it is said, a wolf nursed him. The child was later found by a passerby – Lochan – who gave him to some Britons in the neighbourhood. A tradition held that he went to Rome and was ordained bishop by the Pope. He preached throughout Ireland, and made people “not only Christians but saints.” One account tells how Ailbe petitioned King Aengus of Munster on behalf of St Enda, asking him for a site for monastery. Aengus was unaware of the islands in his domain until he dreamt of them and acceded to grant them to Enda. (The ancient connection between the Aran Islands and the region of his kingdom may be discerned in the name Tiobarad Árann). He founded the monastery of Emly which became very important in Munster. A ninth century Rule bears his name. And the wolf? Ailbe was able to save the wolf when he was present at a run at which she was to be killed. She ate from his table from then on.The feast of Saint Ailbe is celebrated in the Archdiocese on 12 September. Archbishop’s House, Thurles, Co. Tipperary.